Good news. Today is double chocolate donut day. Just put it on in the background as you bake these chocolatey donuts. These low carb double chocolate donuts are a great snack with only 3g net carbs per donut. 1. Preheat oven to 350 degrees F and spray 2 donut pans with cooking spray. 2. In a medium bowl, combine almond flour, cocoa powder, salt, baking soda and sweetener. Use a whisk to mix thoroughly. 5. 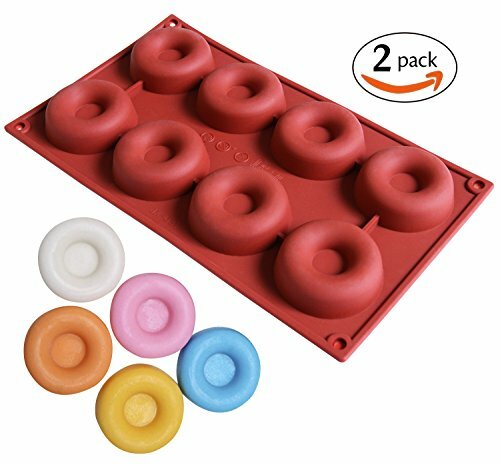 Spoon into prepared donut pans. 8. In a medium shallow bowl, whisk together the powdered sweetener and cocoa powder. Add the heavy cream and water and whisk to combine. 10. Dip the top of each donut into the glaze and let set, about 30 minutes. If you liked this low carb donut recipe, then you might like my recipes for Lemon Blueberry Donuts, Powdered Chocolate Donuts, or Pandan Donuts. I don’t have a donut pan. Can I try this in an 8×8 square pan and make brownies? I just love donuts! and you have a lot great recipes!. Thanks so much for saying so. You have made my day. These were great! I made them for my boyfriend who is on Keto and he loved them. Woops, sorry about that. It’s 3g net carbs for 1 regular sized or 2 mini donuts. I will make that clearer in the text. Thanks! By the way, these things are RIDICULOUS!! Ahhhmazing. I didn’t have the powdered sweetner on hand so I improvised and sprayed a dollop of whipped cream right before eating- delicious! Do you store them in the refrigerator? You can store them in an airtight container at room temperature for up to 2 days or in the refrigerator for up to a week. My son was recently diagnosed with type 1 diabetes so I am always looking for low carb/ keto sweet treats for him but we have to count his total carbs eaten every meal to determine insulin dosage and this only lists net carbs. Do you know the total carb count per serving? I do. (It actually is listed in the nutritional info.) The total carb count is 7g, the fiber is 4g and so the net is 3g. You should also know that this recipe contains erythritol (Swerve) which is a sugar alcohol. When using erythritol in a recipe, I leave this information out of the nutritional info because it has zero calories and zero net carbs after subtracting the sugar alcohol. Sugar alcohols don’t raise blood sugar, so it’s not a good idea to factor them into your insulin dosage. I’m so glad that you are starting your son out on a low carb diet instead of the normal ADA recommended diet. It makes no sense that doctors recommend eating normal carbs, when carbs are the whole problem. Fewer carbs means less insulin and less room for error. It’s overwhelming at first, but this really is the healthiest way to eat if you are a Diabetic. Good luck! Can I use unsweetened coca powder? Yes, that is exactly what you should use. I’m going to adjust the ingredient list to make that more clear. What would be the next best flour to use? I’m allergic to almonds but would love to try this. I would reach for coconut flour next. It behaves differently than almond flour though, so I would try this recipe instead. 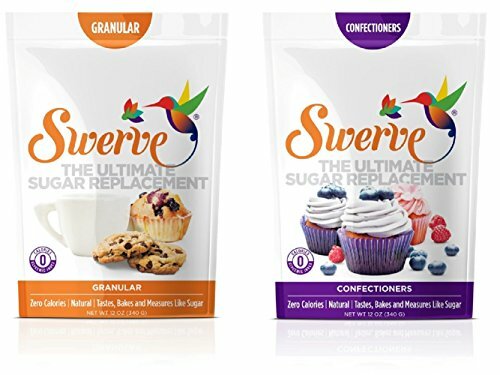 To keep it low carb, you should swap out the maple syrup for Swerve or an equivalent sweetener. I’d start with a 1/4 cup sweetener and taste test until you get the sweetness right. I tried it . I was told to get off sugar and white flour. This was fun and i tbink i need better flour but it tastes pretty good.